Entry-level DSLRs aren’t necessarily ‘low spec’ DSLRs at all; indeed many of the latest ‘entry-level’ models are actually quite well specified. At the very least you can expect your new DSLR to come with an APS-C sensor that’s around ten times larger than the standard 1/2.3in sensors found in most compacts. In addition, you can also expect the autofocus system to be faster and more flexible, with the optical viewfinder providing you with a window that allows you to concentrate on framing your image correctly. With all of that in mind, here are some of the best entry-level DSLRs of 2016. If you’re willing to go body only, the Canon EOS 1300D is available for £278. That’s great news if you’re seeking a second body and want something that will accept your lenses and is familiar to use. On the other hand, if you’re a first time camera buyer, the 1300D is available with a couple of kit lens at just over the £300 mark, which could be a great option for a good value photography starter-pack. The 1300D has an 18 million pixel sensor, Digic 4+ processor, and also has Wi-Fi and NFC inbuilt which means you can transfer images across to your phone, or remotely control the phone. You can also shoot full HD videos, and naturally it’s possible to shoot in raw format and take manual control of your shots. If you’re concerned about a camera body that has a small size, the 100D could be the one for you. At the time of its release it was the smallest DSLR in the world – a title it still holds on to today. It’s got an 18 million pixel sensor, an optical viewfinder, and a touch-sensitive screen. Like with the 1300D, it’s also worth considering that you’ll be buying into an expansive DSLR ecosystem. The A58 takes the highlights of the older A57 and A37 models and condenses them into a single model. 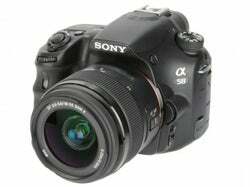 Sony has since announced the A68, but at the time of writing it’s not available on the market. Strictly speaking, the A58 isn’t technically a DSLR – rather it’s what Sony calls a ‘SLT’ (Single Lens Translucent) camera. This basically means that it uses a fixed semi-transparent mirror that allows some light to the sensor and some to the phase detection sensor in the prism. The upshot of this is that the camera employs a 1.44m-dot electronic viewfinder instead of an optical viewfinder. The pay-off for this is increased shooting speed, with the A58 able to shoot at a very healthy 8fps – making it great for capturing fast-moving action with. Nikon and Canon have quite a strong dominance in the entry-level DSLR market, but if you have some old Pentax lenses hidden somewhere in the attic, then the K-S1 could be a good buy for you. It’s got a 20 million pixel sensor, which is missing an anti-aliasing filter for increased detail resolution. There’s also sensitivity up to ISO 51,200 and a maximum shutter speed of 1/6000 seconds. There’s a good range of features for the beginner here, or just someone who needs another Pentax body. You can pick it up for roughly £360, body only, but if you do need a lens to attach to it, you should be able to buy one for just a little extra. The Nikon D3300 follows on from two incredibly popular DSLRs in the Nikon D3200 and D3100. 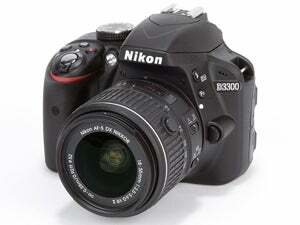 Perhaps the most note-worthy feature is the model’s 24.3MP sensor, carried on from the Nikon D3200. What’s different is that the camera’s anti-alias filter has been removed and as such it should result in sharper images. This high megapixel count and the lack of an anti-alias filter reuslt in some truly impressive image quality that belies the camera’s entry-level status, making the D3300 worthy of a place on the shortlist.